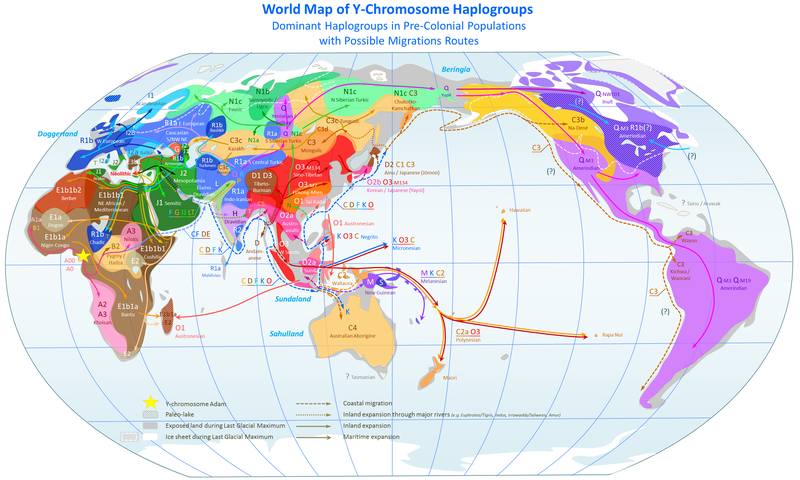 While doing some independent research of my own on the world's genetic diversity, I found this map of the world's primary Y-chromosomal haplogroups and thought I'd share it. Given some of my prior discussions of race and ethnicity, I felt it might be of interest. This only shows the dominant haplogroup(s). The actual genetic diversity in many of these regions is more than it appears (though not so much in others; the Basque in Spain and France for example express 92.7% correlation with Haplogroup R-M207). It also only shows Y-chromosomal haplogroups. The two main types of haplogroups discussed in human genetics are generally Y-chromosomal and mitochondrial. This is because DNA in the Y-chromosome and mitochondria both tend to stay relatively stable compared to other forms of human genetic material, largely because each is passed along solely by one gender (Y-chromosomal DNA is only passed along the male-line, mitochondrial DNA along the female line). Since this map only shows Y-chromosomal DNA it only tells half the story. As I noted in my earlier post about ancient Egyptian genetics, you can see that Egypt is something of a mix of African and Middle Eastern genetics (which one might expect given it lies precisely at the crossroads of Africa and Eurasia). On a related note, it's important to note that not all of these haplogroups are created equal. For example, Haplogroup A is an ancestor to all the other haplogroups on this map and so actually has more genetic diversity within itself than pretty much the rest combined. It and Haplogroup B are only found (natively) in Africa. Haplogroup Q, R, N, and O on the other hand are all relatively young and exhibit comparatively little genetic diversity. Everything else is somewhere in-between. EDIT: An additional item which occurred to me is that the map illustrates quite well how genetics and public perceptions of race do not necessarily match up. For example, Haplogroup E is most commonly found in Africa... but it is also the dominant haplogroup in Greece (and Greeks are usually perceived as "white"). Likewise, while Haplogroup R is most commonly associated with Europeans, it nonetheless has a significant presence in West and Central Africa, where it is found among some speakers of the Chadic or Berber branches of Afro-Asiatic languages (such as the Hausa or Taureg) as well as some other groups like the Fulani. Anyhow, enjoy. I'm also working on my own, similar map, which has multiple layers and shows off more of the individual mix in each country.